Arctic Trucks Middle East is back with a brand new off – roading season! Dubai, UAE, August 15, 2016: Arctic Trucks, the region’s specialist in 4WD vehicles modification has a brand new season planned for off- roading enthusiasts, a schedule which gets into gear this October and includes two trips to neighbouring Oman and also tackling snowy heights in Iceland. After the tremendous success of their first expedition to Iceland earlier this year and previous collaborations with off-roading clubs in the UAE, Arctic Trucks has a new adventure calendar lined up for all those who seek to take on the terrains, whether it be sand or snow! All the trips will have a complete support crew, so one can enjoy the adventurous terrain in a stress-free environment. 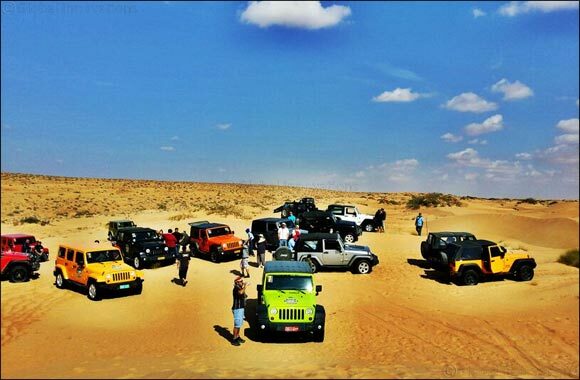 Arctic Trucks’ very own Off Road Club will re-start in October – each month Hjalti and his team will welcome a group of enthusiasts of all levels into the Dubai/Abu Dhabi desert. The club takes place once per month on a Friday morning; it’s complimentary to join and a great chance to network with other thrill seekers. Crossing the border, there is no better way to see the beauty of Oman than alongside The Guide Oman team; a team fully equipped with medics, mechanics and a chef, ensuring the trip is one of the safest ways to tackle the sand dunes. Similar to the Arctic Trucks club, there will be guides and highly trained professionals providing assistance along the entire trip. Like the debut Iceland adventure, the 2017 tour will cover most of the breathtaking areas of Iceland, starting from Haukadalur, home of the great Geysir hot spring, visiting the magnificent Gullfoss waterfall and taking the highland road Kjölurall all the way up to Kerlingarfjöll mountain hut. The volcanic origin of the Kerlingarfjoll Mountain, will see the group explore some hot springs around Kerlingafjöll area and from there they will head to Hveravellir where people can bathe in the natural hot springs. Aiming to include more adventures in the snow, the team plans to take the Kjölur mountain road back down from the highlands, depending on the weather conditions and head to the Langjökull Glacier (Iceland’s second largest glacier) for the snowmobiling adventures. The highlight of the trip will commence from Minniborgir where Arctic Trucks promises the ultimate 4x4 experience, tackling a variety of tracks through breathtaking mountain ranges. These tracks are usually deserted and an ideal area/playground for off-roading enthusiasts. Driving from one place to the other ensures the team will explore tracks that will prove to be not only adventurous but also extremely scenic.